In the early hours of August 1, two Saildrone vehicles, collecting data for NOAA, successfully sailed through the choppy waters of the Bering Strait after a 1600 km transit on their way into the Arctic. The vehicles will now join NOAA’s Arctic Research Program 2017 Northern Chukchi Integrated Study. Here, they s will collect data as part of an observing network of ships and moorings. “Together, these diverse platforms will help give us an integrated picture of physical, chemical, and ecological conditions in the Arctic,” says Cross. The Arctic region is currently undergoing large physical, chemical, and ecosystem changes, mostly caused by sea ice losses. Observing these changes is particularly difficult in a region with limited observational infrastructure. The 58 mile wide Bering Strait links the Bering and Chukchi Seas, forming the Pacific gateway to the Arctic Ocean. The boundary between the United States and Russia extends through this strait, splitting two small islands, Little Diomede (U.S.) and Big Diomede (Russia) only 2.5 miles apart at their closest point. The vehicles stayed well away from land on both sides of the strait, but both were able to see the distant outline of Little Diomede and Fairway Rock on the horizon. This will likely be the last land these drones see for some time. Once north, one vehicle will collect a time series of data across the Distributed Biological Observatory zone 4, an important region of ongoing ecological change. USCGC Healy will visit this area later in the season to collect critical shipboard data. This Arctic mission is jointly supported by NOAA’s Innovative Technology for Arctic Exploration Program, Arctic Research Program, and the Ocean Acidification Program. These groups have been using a variety of autonomous platforms to survey the Bering Sea and the Arctic Ocean for the last three years, collecting an unprecedented amount of data that is expanding our understanding of Arctic seasonal processes and regional-scale ocean acidification. Use of the Saildrone vehicles will help to fill important data gaps and expand NOAA’s observing conducted through traditional platforms. “This is a case of having the perfect tool at exactly the right time," says Mathis. A shorter version of this story is posted on NOAA.gov as a Photo Story. 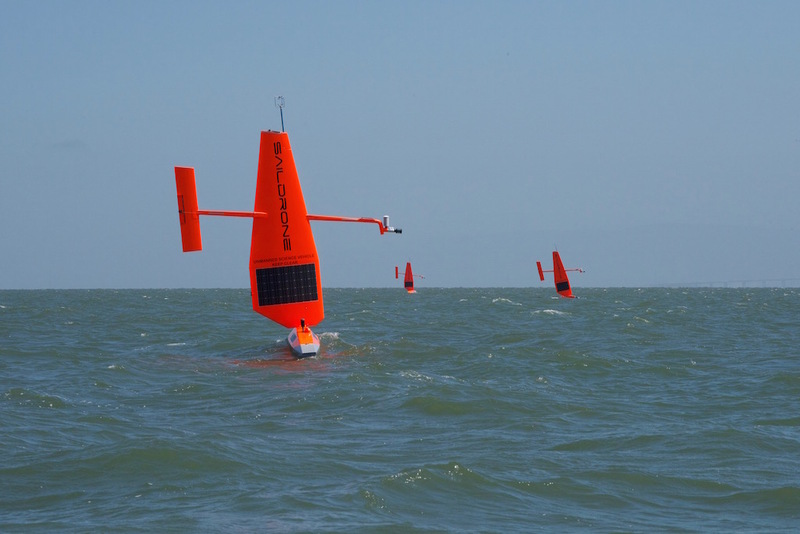 You can find information on the launch of the saildrones at OAR.gov and a similar story at NOAA.gov. Follow NOAA Research on social media via Facebook (NOAA Office of Oceanic and Atmospheric Research), Twitter (@noaaresearch) and Instagram (noaaresearch). View from a sailing drone. While transiting Bering Strait, one of the drones captures Little Diomede in the United States and Big Diomede in Russia. The four views here are facing varying directions on the drone including forward, aft and above. These images help to monitor how the drone is operating under varying weather conditions and often give us a sense of place during these missions. VIsit NOAA.gov for more on this image. 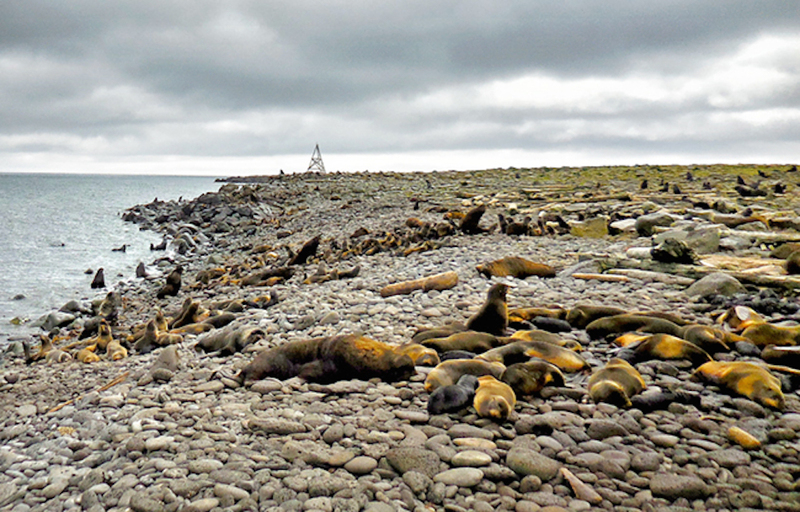 Carey Kuhn's field team is back in Seattle and the fur seals are off on their first foraging trip. It was a slow start but their last few days on St. Paul were very successful. They attached 16 tracking instruments to adult females and caught and weighed 15 of the females’ pups. This will give Carey and her team a starting point to measure pup growth over the season, which they hope to relate to the moms foraging success. To help locate the pups when they return in September, each pup was given a unique haircut on its head. These marks will be visible until the pups go through their first molt in early September. The marks will help the researchers ensure they capture the correct mother-pup pairs when it comes time to recover the tracking instruments. Five of our fur seals have already completed their first foraging trips. In between foraging trips the female fur seals will spend 1 to 2 days on shore nursing their pup and resting. These periods on shore are an important time for the pups to get the milk they need to grow throughout the season. The mother-pup pairs will continue this cycle until the pups are approximately four months old. Jessica Crance set sail for 60 days on board the Yushin Maru #2, as part of the Pacific Ocean Whale and Ecosystem Research (POWER) program, a collaborative effort spearheaded by the International Whaling Commission, to survey for whales and porpoises in the eastern Bering Sea. "My main goal is to locate animals from the eastern North Pacific population of the North Pacific right whale, arguably the most endangered large whale population in the world," said Crance. "With luck, the visual observers will be able to spot the animal, at which point we will attempt to photograph and obtain biopsy samples; these will provide crucial information on the current population status." Read more of this blog post and follow the teams research in the field at NOAA Fisheries Alaska: Dispatches from the Field blogs, 'Rare Opportunity to Study the Critically Endangered North Pacific right whale in the Bering Sea'. 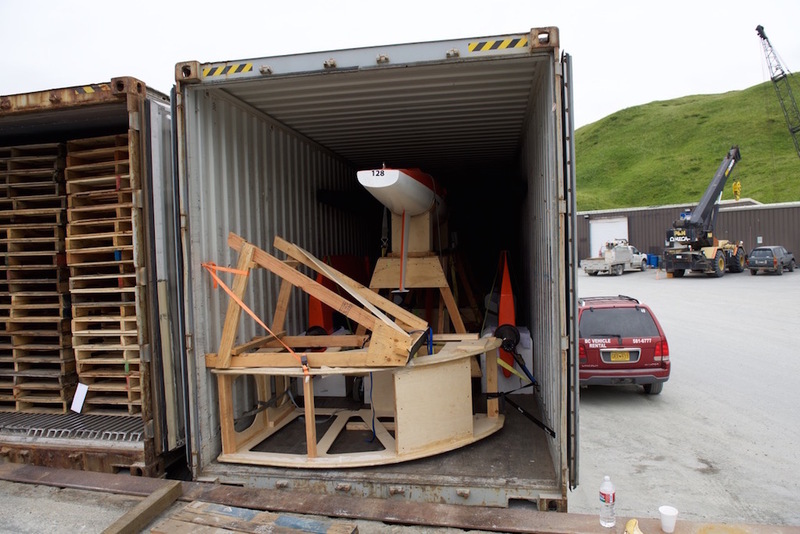 The journey begins for the last of three saildrone launched in Dutch Harbor, Alaska on 18 July. Photo: Saildrone Inc.
Our journey begins in Dutch Harbor, Alaska. Two shipping containers arrived from San Francisco at a storage facility on the Aleutian island of Unalaska. They are unpacked, the equipment is assembled, and the sensors were turned on and then dry-tested. Once ready for launch, the assembled saildrones will began their three-month journey traversing the remote and inhospitable seas off Alaska. They will travel thousands of miles and reach areas never before surveyed with such specialized technology. Richard Jenkins, owner of Saildrone Inc. whom NOAA partners with to conduct this research, is on site with his team. Like the innovative platforms he created, he will even control the drones from his iPhone here in Alaska and even when he returns to California after launch. Almost two weeks delayed, the teams have modified their missions to adapt to the changing schedule. That we can abruptly change tactics like this and still be successful speaks to the saildrone's inherent flexibility and adaptability, one of the key reasons ITAE pursued this platform for development. 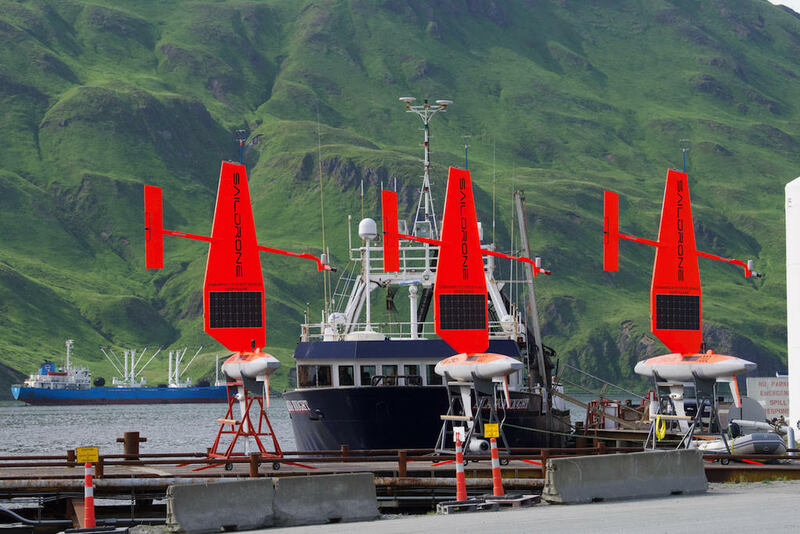 As they travel away, the three saildrone are a fluorescent beacon amidst the lush green mountains of Unalaska. 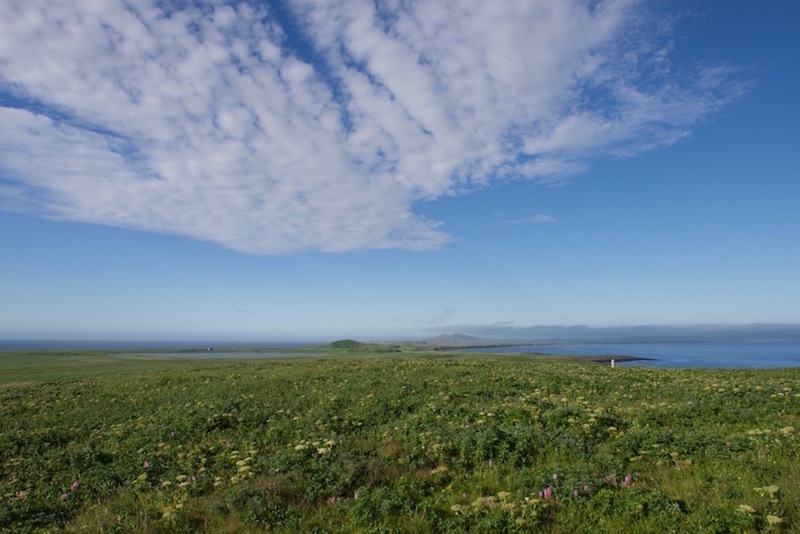 For the first time, the vehicles will journey through the Bering Strait into the Arctic with a newly adapted system to measure CO2 concentrations. They will start with comparison and calibration activities at the long-term mooring site M2, in the southeastern Bering Sea. Then it’s off to Bering Strait. The third drone will survey more than 3,100 nautical miles in the Bering Sea alone in search of walleye pollock, Northern fur seals that prey on them and the elusive North Pacific right whale. This work builds on research conducted during 2016in partnership with our neighbor here in Seattle - NOAA Fisheries Alaska. We are all extremely excited for this years missions, and are patiently waiting for these larger faster saildrones to reach their main survey regions so we can start to answer questions about this highly productive and important (to all of us) ecosystem. The three drones are in the water and ready to go. 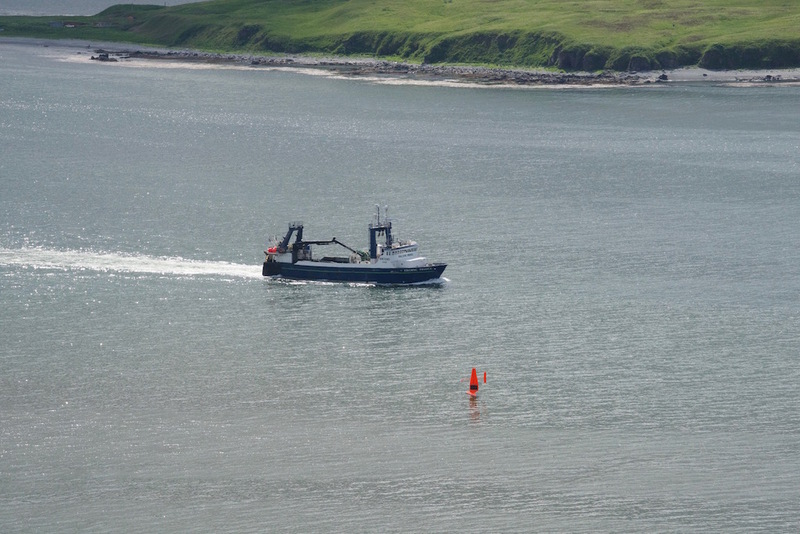 Photo: Saildrone Inc.
One of the three drones heading out of Dutch Harbor. Photo: Saildrone Inc.
Carey Kuhn and Jeremy Sterling have been on St. Paul Island for a couple of days and managed to get out seven tracking instruments on northern fur seals. Just like 2016, the work is being done on the northeast side of the island. By using the same tagging location, they will be able to compare years to look for a difference in both fur seal behavior and walleye pollock distribution. "Over the next few days, we’ll finish deploying the fur seal tracking instruments and then head back to Seattle." said Kuhn. "Although the deployment process is a bit slower this year, I think we’ll be able to get out all 16 instruments before it’s time to leave." Read more of this blog post and follow the teams research in the field at NOAA Fisheries Alaska: Dispatches from the Field blogs, 'Northern fur seal food study in Bering Sea using Saildrone: Second year adding video'. You can also learn more about the 2016 field season, 'Understanding northern fur seal relationship with prey key to conservation'. We had a successful launch in Dutch Harbor, AK today. The three drones are currently making way to their respective survey locations. Three saildrone are being prepped for launch in Dutch Harbor, Alaska. Photo: Sialdrone Inc. The containers arrived in Dutch on Saturday, so R. Jenkins and D. Peacock (both of Saildrone Inc.) spent the day assembling the vehicles. They plan on launching the drones tomorrow. Stay tuned. Packing the 2016 saildrones into a shipping container at the end of the mission in September. Photo: Saildrone Inc.
Jessica Crance is a research biologist at Alaska Fisheries Science Center. She is back for a second year of marine mammal acoustics in search of the elusive North Pacific right whale. While the Saildrone project does not have a marine mammal acoustic field component, Jess had a unique opportunity to participate in International Whaling Commisions 8th Pacific Ocean Whale and Ecosystem Research (POWER) survey. Over the next few months, she will be part of an international team of scientists studying whales in the Bering Sea. Jessica will be listening for North Pacific right whales in particular and is hoping to locate one of the 30 or so remaining North Pacific right whales known to inhabit the eastern portion of the Bering Sea. If she does, she and others will photograph and collect small skin samples to learn more about these elusive and critically endangered creatures. Jess will be conducting her research on board a Japanese research vessel that was provided to the International Whaling Commission by the Government of Japan for the Commission’s survey. TWhat’s exciting is that this will be the first time that there will be an acoustic component to the research program. It also is the first time that there has been an opportunity to explore the expanse of the Bering Sea in search of North Pacific right whales. We are hoping for an opportunity to have our two surveys meet, to provide acoustic calibration of what sounds we may be hearing. Follow her field research at NOAA Fisheries Alaska: Dispatches from the Field blogs, 'Rare Opportunity to Study the Critically Endangered North Pacific right whale in the Bering Sea'. Carey Kuhn is an Ecologist at NOAA Fisheries Alaska. She is back for a second year of tracking northern fur seals on St. Paul Island and measuring prey availability in the northern fur seals feeding area. Follow her field research at NOAA Fisheries Alaska: Dispatches from the Field blogs, 'Northern fur seal food study in Bering Sea using Saildrone: Second year adding video' and 'Understanding northern fur seal relationship with prey key to conservation'. This week Carey is headed to St. Paul to deploy the first round of dive recorders and satellite tags. The goal this year is to put tags on 16 females. Carey will post an update of her progress while on St. Paul . "Continuing this work is a fantastic opportunity that will help us build on what we learned in 2016", says Kuhn. "I’m looking forward to jumping back into the box and seeing how the fur seals are doing this year." 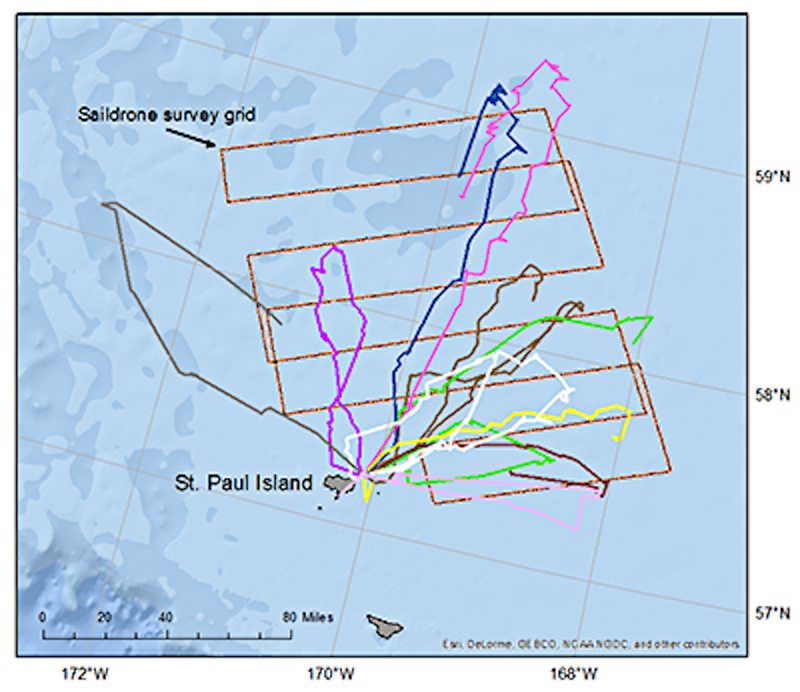 Carey and her team will head to St. Paul again in early September, to deploy the new video cameras for a single foraging trip and to recover all of the tracking instruments. St. Paul Island. Photo: Saildrone Inc. 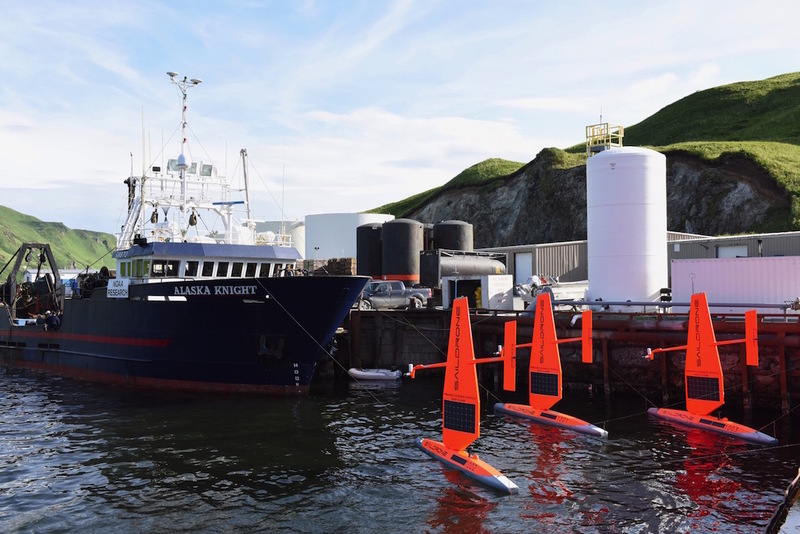 In mid-July, scientists will send off the first unmanned sailing vehicles from Dutch Harbor, Alaska, with two sailing north through the Bering Strait into the Arctic Ocean and another transiting the Bering Sea. Traversing Alaska’s inhospitable waters, the remotely-operated vehicles will track melting ice, measure the ocean's levels of carbon dioxide, and count fish, seals, and whales to better understand their behavior and population. For the first time, the vehicles will journey through the Bering Strait into the Arctic with a newly adapted system to measure CO2 concentrations. “We want to understand how changes in the Arctic may affect large-scale climate and weather systems as well as ecosystems that support valuable fish stocks," says Jessica Cross, an oceanographer at NOAA Research’s Pacific Marine Environmental Laboratory (PMEL), who is using the unmanned system to study how the Arctic Ocean is absorbing carbon dioxide. Summer of sailing drones. Photo: Saildrone Inc.
We are prepping for the 2017 missions. In the meantime, here are the 2017 missions team members.